Do you love the taste of caramel? Are you a fan of that sticky, gooey sweetness combined with delicious, smooth chocolate? 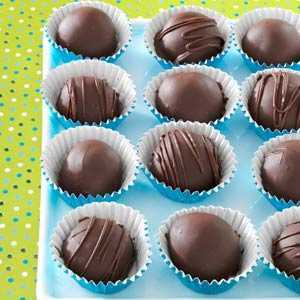 If so, you’re sure to love chocolate caramel truffles! 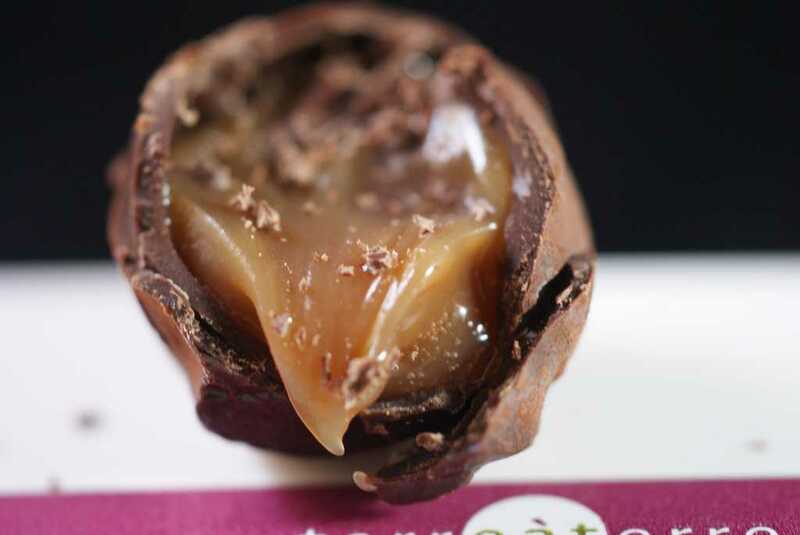 A chocolate caramel truffle is simply a tasty truffle ball that includes caramel as one of its main ingredients. In this article, I’ll give you plenty of tips on how to make these excellent confectionaries for yourself, even if you’ve never made a truffle before in your life. I’ll give you a step by step guide on how to make caramel from scratch, so if you choose a recipe that calls for prepared homemade caramel, you’ll know where you can get started. I’ll also provide you with lots of tips and tricks for how to make your truffles better than ever before, and of course, I’ll give you a list of my favorite recipes. At the end of this article, I’ll even be sure you know my recommendation for the best caramel chocolate truffle recipe out there. By the time you’ve finished reading through the information listed here, you’ll be ready to head into the kitchen and start making truffles right away. So what are you waiting for? Let’s get started learning about caramel chocolate truffles! Making caramel from scratch is not as complicated as it might sound. If you have never tried to make caramel before, remember to pay very close attention to this step by step guide, so you know what you’re doing along the way. Although it is possible to burn a batch of homemade caramel, it’s also very easy to prepare it the right way without any unwanted consequences. Follow this guide and you’ll be whipping up caramel like a pro without so much as a second thought! For this method, you’ll need only a handful of materials and ingredients to help you get started. Be sure to gather everything you need beforehand, and try not to cut corners. In any recipe, when a specific type of bowl or another utensil is mentioned, it’s a good idea to get the right kind so as to avoid any problems during the process! Heavy-bottomed saucepan – Be sure to choose one that’s medium to large in size. You want the bottom of the pan to be coated thinly, so the caramel doesn’t set up too thickly. However, be sure the pan isn’t so large that the recipe won’t completely cover the bottom at all. Rubber spatula – You need to use a heat-resistant utensil for pushing the caramelized sugar around in the saucepan. Never use a metal spatula for this job. You can try a wooden spoon or a silicone whisk instead if you don’t have a rubber spatula on hand. Heat-resistant glass jar or dish – A mason jar lined with plastic wrap is a good solution if you’ll be storing your caramel for a while. However, if you need it pretty quickly for a recipe, use a square glass baking dish lined with plastic wrap instead. 1 cup white sugar – Any type of white sugar will work for this recipe. Brown sugar will not. ½ cup heavy whipping cream, slightly warmed – Don’t boil your whipping cream or even bring it to a simmer before using it for this recipe. Just stick it in the microwave in a microwave-safe bowl for a few seconds to give it a little bit of heat. 1/3 cup butter – Choose unsalted stick butter if possible. Margarine won’t work the same way in this recipe, and salted butter might make your caramel too salty. Optional 1 tsp sea salt – If you plan to make a sea salt caramel truffle, you do need to add a small amount of sea salt to this recipe to make it taste right. Don’t overdo it, and try not to use table salt, since it won’t have the same effect. Optional ½ tsp pure vanilla extract – For a richer, fuller caramel flavor, add just a little bit of vanilla to this recipe to perk it up. Be very careful not to add too much, or you run the risk of making your caramel too liquid to solidify the right way. Be sure to follow these directions carefully so as to avoid any possible pitfalls when making your caramel chocolate truffles! Be very careful and don’t skip any steps along the way. 1. Measure out your ingredients ahead of time. Caramel requires quick action at some stages, so you don’t need to stop and try to measure out anything when the time comes. 2. Put the sugar in your heavy saucepan and heat it over medium heat on the stovetop. 3. You’ll start to notice the sugar browning on the edges of the pan. Use your rubber spatula or another heat-resistant utensil to push this toward the center of the saucepan as it begins to brown. 4. Every now and then, stir the sugar to keep it from burning. However, don’t stir it constantly, or it will clump up too much and be harder (though not impossible) to work with in the long run. 5. When the sugar as melted, keep cooking and occasionally swirling the pan until the caramel turns dark amber. 6. Stand back away from the pan and add the butter carefully. The caramel will bubble and may splash, so be very careful. 7. Whisk quickly until butter is completely melted and thoroughly mixed into your caramel. 8. Remove mixture from heat and add cream carefully, a little bit at a time. Whisk well to combine thoroughly once again. 9. Add sea salt and whisk again. 10. Pour into glass baking dish or mason jar lined with plastic wrap and let stand until it reaches room temperature. 11. Store in the refrigerator for 2 weeks or in the freezer for 2 months. When you follow the directions listed above, you’ll be able to make delicious homemade caramel from scratch with ease. But what can you do when you want to put together a batch of truffles that tops every other batch you’ve ever created before? Keep these tips and tricks in mind to help improve your truffle game every time you work through a recipe. You’ll notice improvements in your candy making process right away! Use high-quality baking chocolate. Choose chocolate that is at least 50% cocoa content, but don’t be afraid to go for 70% if you like the taste of very bitter chocolate in your candy. Use a double boiler for melting your chocolate. Set up a double boiler by placing a metal bowl over a small saucepan filled with about one inch of water. Bring the water to a boil, then reduce it to a simmer. Melt your chocolate in the metal bowl without removing it from the water. Always reheat your caramel before using it in your truffle recipes. Reheat it in a double boiler as listed above, or just place it in a saucepan on the stove for a few minutes. You may be able to microwave it as well, but be sure to stir it often to keep it from heating unevenly if you do this. Stir melting chocolate in the same direction at all times. This keeps it from becoming streaky or bubbly, which in turn makes it easier to dip your truffles and keep them looking smooth. Do not let water get near your melting chocolate. Even a single drop of water will cause your melting chocolate to seize and it will not be usable as a dipping chocolate. Although it’s always nice to make your chocolate caramel truffles from scratch completely, sometimes it just isn’t doable. When you’re looking for a truffle recipe that can help you get the sweet taste of caramel and chocolate quickly, without taking the time to prepare caramel sauce from scratch, this is the best place to get started! Try out this easy recipe the next time you’re invited to a party at the last minute and need a quick dessert to bring along. 1. Place caramels in a large microwave-safe bowl along with heavy whipping cream and all of the milk chocolate chips. 2. Microwave on high, uncovered, for one minute, then stir well. 3. Microwave for 15 seconds at a time and stir each time until the chocolate and caramels have melted together completely. Be careful not to burn the ingredients by microwaving for too long. 4. Spread mixture into a square baking dish lined with plastic wrap. 5. Chill in the refrigerator, uncovered, for 1 hour. 6. Remove candy filling and slice into 30 pieces of about 1 inch each. 7. Roll each piece into a ball by hand and place on a lined baking sheet. 8. Chill, covered, in the refrigerator for 1 hour more. 9. Melt all of the semisweet chocolate chips and the shortening together in a large microwave-safe bowl on high. Repeat the process from earlier: melt for 15 seconds at a time, stirring each time until smooth. 10. Dip chocolate caramel balls one at a time using a fork. 11. Tap to remove excess chocolate, then return the truffles to the baking sheet. 12. Let stand at a room temperature to harden. This exciting recipe incorporates fleur de sel, which is a very old-fashioned type of salt harvested from sea water that is used in a variety of upscale recipes. If you can find this delicious ingredient, you’ll be able to create an incredible truffle recipe you will want to share with all of your friends and family! Bring a batch of these truffles along to your next big holiday party or family get-together and you will surely wow everyone you know with the incredible flavors in this recipe. 1. Finely chop baking chocolate and place 8 ounces in a metal bowl over a double boiler. 2. Melt and stir gently until chocolate is completely smooth, then remove from the stove top. 3. In a separate small saucepan, combine 2 tbsp water with white sugar and stir, cooking over medium heat until dissolved completely. 4. Turn heat to high and boil until the mixture turns amber. 5. Add cream and reduce heat to low. Stir often until the mixture becomes smooth. 6. Add ¼ tsp fleur de sel to melted chocolate and stir in caramel mixture. 7. Cover and chill in the refrigerator for 3 hours. 8. Cover and chill in the refrigerator for 3 hours. 9. Roll mixture into 1-inch balls by hand and place on a lined baking sheet. 10. 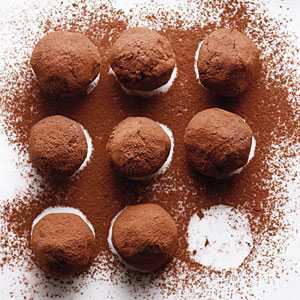 Roll each ball in Dutch-process cocoa powder and then return to the lined baking sheet. 11. Chill in the refrigerator, covered, for at least 5 hours. 12. Set up another double boiler on the stove top and melt remaining dark chocolate, stirring gently until smooth. 13. Dip truffle centers one at a time using a fork, then tap to remove the excess. 14. Return to the lined baking sheet and sprinkle with additional fleur de sel if desired. 15. Let stand at room temperature to set. Who doesn’t love a rum ball, especially around the holiday season? 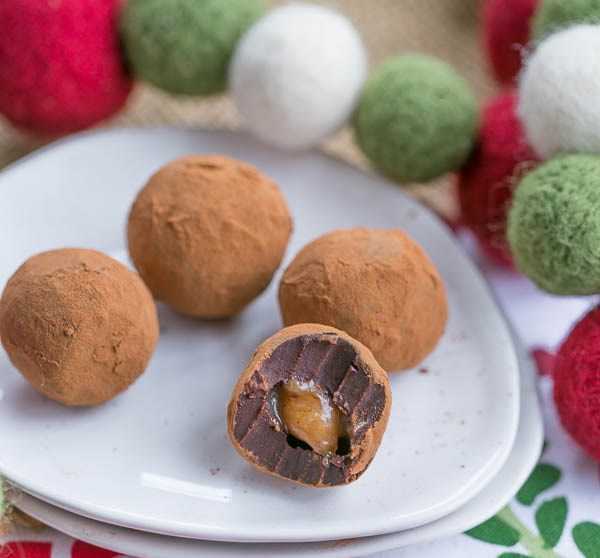 With this recipe, you can combine the best of the world of truffles with a delicious rum ball recipe to create something that is new, exciting, and perfect for serving up to your guests at a holiday party. These candies also make excellent gifts at any time of the year, and you’re sure to be a crowd-pleaser when you hand them out to everyone you know! This is a quick and easy recipe that you’ll be able to prepare in no time. 1. Finely chop baking chocolate and place in a large heat-resistant mixing bowl. 2. Pour heavy whipping cream into a small saucepan and heat on low until just before boiling. 3. Strain through a fine sieve into the bowl of chopped chocolate, then let stand for 3 minutes. 4. Gently whisk until cream and chocolate have melted and become smooth. 5. Add coffee, rum, and vanilla, and whisk again to combine thoroughly. 6. Let stand at room temperature for 1 hour. 7. Roll out 1-inch balls by hand and place on a lined baking sheet. 8. Roll 1-inch balls of caramel mixture and press each one into the center of the chocolate balls. Form the chocolate balls by hand around the caramel as necessary until smooth. 9. Roll balls in the Dutch-process cocoa powder and return to the baking sheet. 10. Chill in the refrigerator for 1 hour to set up. 11. Serve at room temperature. This is a unique recipe that combines the delicious taste of peanuts with the smooth texture of caramel to create a truffle that’s sure to remind you of your favorite candy bar. These excellent truffles are very sweet, and they’re quite popular with the younger members of the family as well as with adults! Serve them at your children’s next birthday party as sweet bites for all of their guests, or just keep them on hand at home to give you a great way to satisfy your sweet cravings throughout the day. 1. Finely chop baking chocolate and set aside. 2. If your caramel has not been freshly prepared, reheat it on the stovetop until it’s smooth and melting. 3. Add the chocolate, salt, vanilla, and peanut butter to your hot, melted caramel mixture and let stand for 5 minutes. 4. Gently whisk the mixture together until chocolate and peanut butter have melted completely and the mixture is very smooth. 5. Let cool to room temperature, then cover tightly with plastic wrap and chill in the refrigerator for 2 hours. 6. Roll mixture into 1-inch balls by hand and place on a lined baking sheet. 7. Roll balls into finely chopped peanuts to coat thoroughly. 8. Cover and chill in the refrigerator on the lined baking sheet for 1 hour more. Chocolate, caramel, and sea salt have been a popular flavor combination for years now, and with this delicious recipe, you’ll soon see why! Put this recipe together and you’ll be able to enjoy a sweet and savory bite of your favorite candy whenever you feel a craving come on. These truffles have a little bit of an added flair that makes them a great option if you’re looking for something to give out as a gift to the special people in your life. 1. Line a square baking pan with plastic wrap and set aside. 2. Coarsely chop baking chocolate and set aside as well. 3. Add sugar, butter, corn syrup, and ½ cup whipping cream to a large, heavy saucepan over medium-low heat. 4. Bring to a simmer and stir constantly. Continue cooking and stirring for 7 minutes until smooth, melted caramel has formed. 5. Remove from heat and add remaining ½ cup heavy whipping cream a little bit at a time. 6. Stir to combine thoroughly. 7. Cook over medium-low heat for 10 minutes more, stirring often. 8. Pour mixture into baking pan and let stand 1 hour. 9. 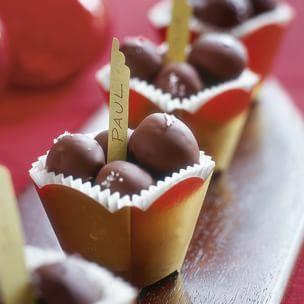 Scoop out ½-inch balls of caramel and place on a lined baking sheet to stand at room temperature for 1 hour. Sprinkle with sea salt. 10. Set up a double boiler on the stovetop and add chopped baking chocolate. 11. Melt and stir gently until smooth. 12. Dip balls one at a time using a fork and tap to remove the excess chocolate. 13. Return to the baking sheet to set up at room temperature for about 15 minutes. Why should peanuts and chocolate have all the fun when it comes to combining with caramel and sea salt? With this delicious recipe, you can add coconut flakes into the mix to create a unique and delicious candy you’ll want to enjoy again and again. This is a simple recipe without too many ingredients, and if you’ve already made your homemade caramel sauce ahead of time, you’ll have one of the steps completed before you even begin! 1. If your caramel is not being made fresh for this recipe, reheat it on the stovetop until it is smooth and melting. 2. Finely chop baking chocolates and place in a large, heat-resistant bowl. 3. Pour hot caramel over baking chocolate and let stand for 1 minute. 4. Stir slowly with a rubber spatula, moving in the same direction at all times, until completely melted. 5. Let stand at room temperature for 15 minutes. 6. Roll into 1-inch balls by hand and place on a lined baking sheet. 7. Sprinkle with sea salt and then roll balls in coconut flakes. 8. Return to the lined baking sheet and chill, uncovered, in the refrigerator for 2 hours. With only five ingredients, this is a very easy recipe to put together when you want to include everyone in your circle of friends and family, regardless of dietary needs! This is a vegan recipe, but it also fits into a gluten-free diet easily. Even if you’ve never worked with vegan candies before, you’ll be surprised at how easily you can complete this recipe without much effort at all! 1. Place soaked and drained dates into your food processor, then pulse on high until a loose dough is formed. 2. You can add a little bit of water at a time to help form the dough if necessary, but you may not need to. 3. Add ½ tsp sea salt and pulse a few more times. 4. Roll mixture into 1-inch balls by hand and place on a lined baking sheet. Chill, uncovered, in the freezer for 30 minutes. 5. Drizzle natural peanut butter over the tops of each date ball until covered, then return to the freezer again for 20 minutes to form a shell. 6. Set up a double boiler and add vegan chocolate. Melt and stir gently until chocolate is completely smooth. 7. Dip your vegan caramel peanut butter balls into the melted chocolate one at a time using a fork, and then tap to remove the excess. 8. Return to the lined baking sheet and top with a little bit of extra sea salt. 9. Chill in the freezer for about 1 hour more. Try this rich chocolaty recipe when you want to create a unique twist on the classic chocolate caramel truffle! This recipe is easy to put together in a short amount of time, and it’s another great one that can help you utilize your own homemade caramel sauce. Try out this recipe for the holiday season, or make a batch and give them away to someone special when Valentine’s Day rolls around. This is a romantic treat you’re sure to love! 1. Finely chop both chocolates and set aside. 2. If your caramel has not been made fresh for this recipe, reheat it on the stovetop until it’s melted, hot, and smooth. 3. Stir bourbon and vanilla into your caramel until thoroughly combined. 4. Add chocolate and let stand for 1 minute. 5. Stir gently until the chocolate has become melted and the mixture is smooth. 6. Cover and chill in the refrigerator for 2 hours. 7. Roll into 1-inch balls by hand and place on a lined baking sheet. 8. Roll in Dutch-process cocoa powder and return to baking sheet. 9. Chill for a few minutes in the freezer to set up. Round out the list of incredible chocolate caramel truffle recipes with a different take on this popular confectionary: a caramel cookie truffle. With this recipe, you can create a simple version of truffles that won’t take as long as many of the other recipes listed here. This is also a very fun and kid-friendly recipe that the younger members of your family can get involved with anytime, especially if you take care of the dipping stage yourself. 1. Make cookies according to packaging directions, then let cool for about 15 minutes. 2. Process half of the cookies into a fine crumb in the food processor. Repeat the process until the entire batch has been turned into crumbs. 3. Return all cookie crumbs to the food processor and add the cream cheese. 4. Pulse on high until mixture can be easily formed into a ball. 5. Roll into 1-inch balls by hand and place on a lined baking sheet. 6. Chill, uncovered, in the refrigerator for 15 minutes. 7. In a large microwave-safe bowl, melt chocolate for 15 seconds at a time on high, stirring each time, until completely smooth. 8. Dip cookie balls one at a time in the chocolate mixture using a fork. Sprinkle over toffee bits. 9. Return to the lined baking sheet and chill in the refrigerator for 45 minutes. There are tons of different chocolate caramel truffle recipes out there, and we’ve really only scratched the surface here! As you can see, you have a lot of recipes to choose from. You might be feeling a little bit overwhelmed now and wondering which one is the best one for you to try, whether you’re a beginner or an expert in the field of truffle making. 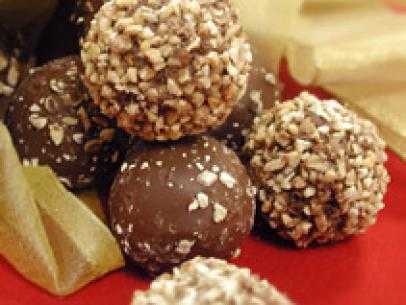 For one of the best recipes to help you get started learning how to make caramel chocolate truffles on your own, try the Peanut Caramel Truffles. This recipe isn’t too hard to put together, and it calls for only ingredients you’ll be able to find at any grocery store. It doesn’t take too long, and you’ll be rewarded with delicious, sweet chocolate truffles the whole family is sure to love. You can’t go wrong choosing this recipe! On the other hand, if you’re looking for something a little different, I highly recommend trying the Vegan Caramel Chocolate Truffles instead. Even if you’re not a vegan yourself or you’re not looking for a gluten-free truffle recipe, do yourself a favor and give these a try anyway. You’ll be surprised by how delicious and smooth they taste, and how much they resemble caramel too! Whichever recipe you decide to create, you’ll be ready to get started in no time when you follow the tips listed in the first part of this article. Pick your favorite, gather your ingredients, and get ready to start making truffles with smooth, creamy caramel right away!